Julianne Paintings, music and musings: "Childhood Memory"
When I was a kid my aunts used to give my sister and I those little trolls. We wound up with quite a flourishing community of them. They were superbeings that could do anything and tended to get involved in whatever activities we humans were into at the time. A friend visiting Tokyo recently dragged me into Kiddyland to get a couple of troll moneyboxes for her nephews. I grabbed one too just for fun (it has a slot in the back). Man, it was hard to paint! But I'm happy with how it turned out, quirky proportions and all! I really learned a lot doing it. The hair was pure fun and the imperfect proportions just add to it's charm as far as I'm concerned. At any rate, here I was more interested in applying the paint than perfect drawing. Edit: my mother saw this and informed me that she too was troll crazy and provided us with the little ones (the pencil holder / keyring size). Apologies for missing this important credit! Hey, just checked in, and what a surprise! You've done a great job here, it's loaded with personality, and the way you captured the eyes! Those dolls always wigged me out a little, as a kid. You've turned the "scaryness" into friendly and playfulness. Wow! Does that bring back memories! I remember the gear heads driving muscle cars back in the '70s used to mount those things behind the back seat. If you drove behind a Mustang or a GTO you would often find a troll staring out the rear window at you. Some had reflective eyes that would light up at night when a car's headlights hit them. Creeply little things always looked alive when that happened. Those were "teen toys" in the neighborhood I grew up because of their hot rod ornament status. Whenever they were in view, Led Zeppelin, Blue Oyster Cult or something along those lines was probably playing on a nearby radio. Great painting! 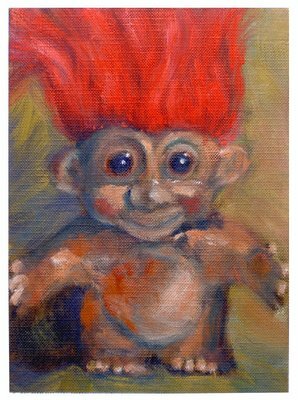 Perhaps you could do a series just on trolls? Haha, it seems that everyone has had some kind of childhood troll experience! I had no idea that they were cultural icons for hot rod freaks in America. Did that bleed over into Australia? Who knows... I was just a little kid who knew nothing about such things. Powerful little things, aren't they?! Thanks for the nice comments on the painting. Mela, I'm glad you see another side to them now ;) I set it up under lights, so there were some nice highlights in the eyes. Thomas, I might revisit this subject many months further down the road. The hair and the face are outstanding. The hair is done in real detail with each strand individually imagined. The face is absolutely great. The personality of the Troll really comes through. Another vote for a Great job! Thanks, Bill. Feedback like that from an astute eye like yours is appreciated.